This statistic shows the amount funded by the top public funders for research and development on neglected diseases worldwide in 2017. 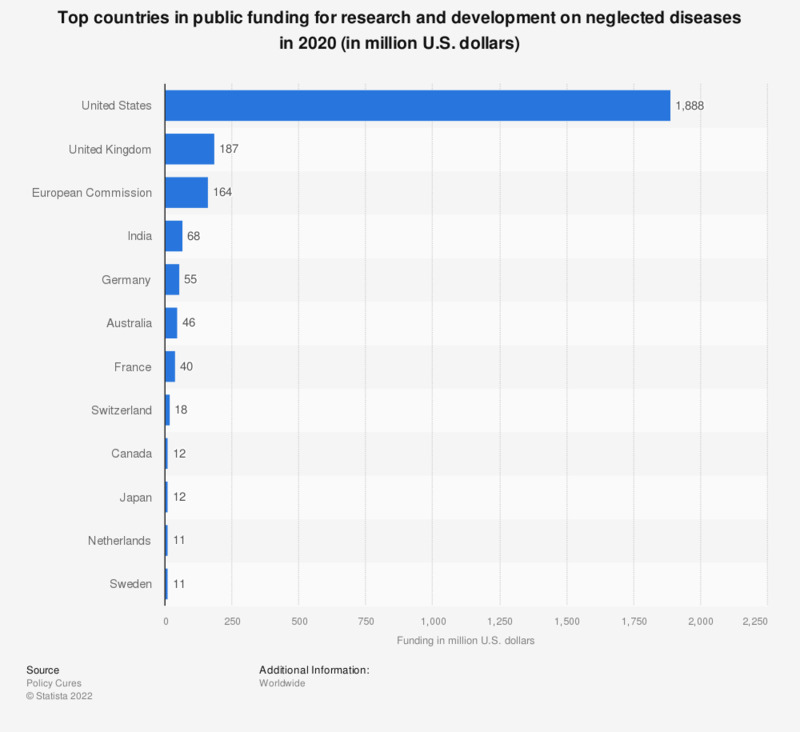 In that year, the United States was responsible for some 1.6 billion U.S. dollars in public funding for R&D on neglected diseases. The United States contributes a large portion of global public funding for research and development on neglected diseases, totaling almost 1.6 billion U.S. dollars in 2017. The European Union contributed a total of about 119 million U.S. dollars. Many people in the world’s low-income countries suffer from neglected diseases as donor funding is rare in wealthier countries. These diseases are a significant source of disability and mortality in these regions and many suffer from more than one disease simultaneously. There were 98 medicines and 11 vaccines in the R&D pipeline for neglected diseases as of 2016. The Bill & Melinda Gates Foundation is one of the largest philanthropic funders of R&D worldwide, raising 553 million U.S. dollars in 2017. This foundation is one of the largest private foundations in the world and was launched in 2000. Its headquarters are located in Seattle, Washington. The foundation gave 3.2 billion U.S. dollars in 2013. In regards to neglected diseases, the foundation aims to reduce the burden of disease through effective control, elimination, and eradication efforts. Neglected Diseases are mostly tropical infectious diseases that receive less attention behind the big diseases (usually: HIV, malaria, tuberculosis) and are therefore labeled 'neglected'. Statistics on "Neglected tropical diseases (NTDs)"